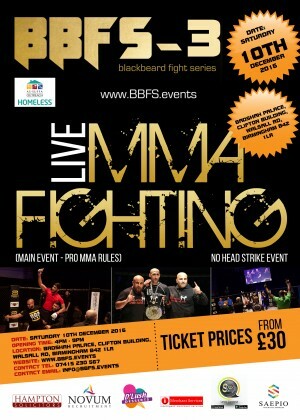 BBFS 3 in support of the As-Suffa Homeless Project is coming to Birmingham this December! Blackbeard Fight Series 3 will feature no less than 6 Championship Title Fights on the night and is set to be their biggest fight night to date. There will be two title defences and four new champions will be crowned. It is time now for the new era of warriors to stake their claim as Champions of Blackbeard Fight Series. Come and support the Homeless Project and enjoy an action packed event for all!